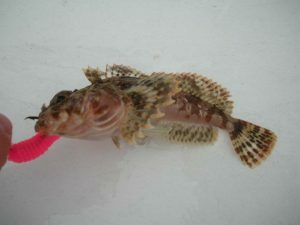 Most Speckled Sanddab specimens are left-eyed, but they one of a handful of flatfish species that can occasionally go the other way. I’ve caught two and both happened to be right-eyed versions. After an eventful day, today paled in comparison. 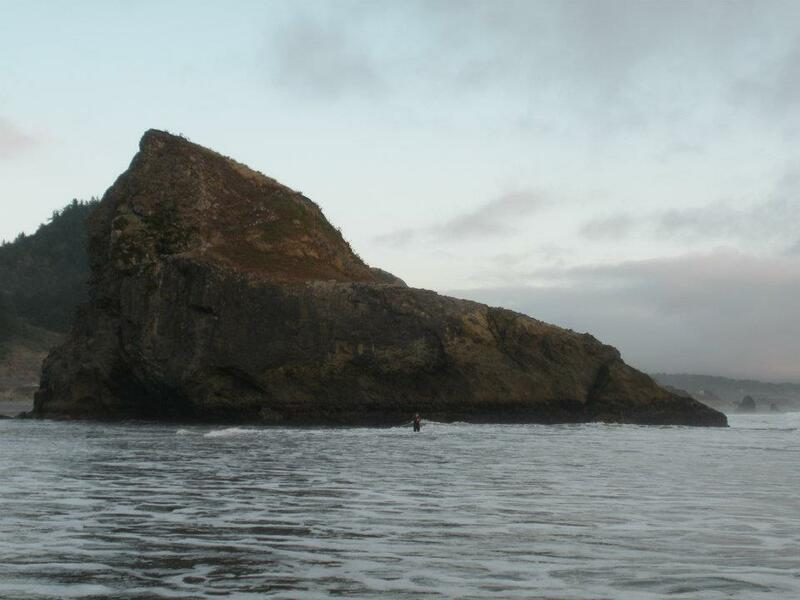 My friend Ben Blanchard and I tried fishing the Rogue River Jetty in Gold Beach, but the sea lion sirens were deafening, so we didn’t stay there long. On the drive back to Brookings, we noticed a small creek flowing over the beach between some large rock formations. It looked idyllic, so we parked and walked down. Myers Creek is a gorgeous beach with extreme terrain that includes monoliths so large, they make people look like insects. It ended up being Myers Creek, and we fished in the surf where it flowed in. 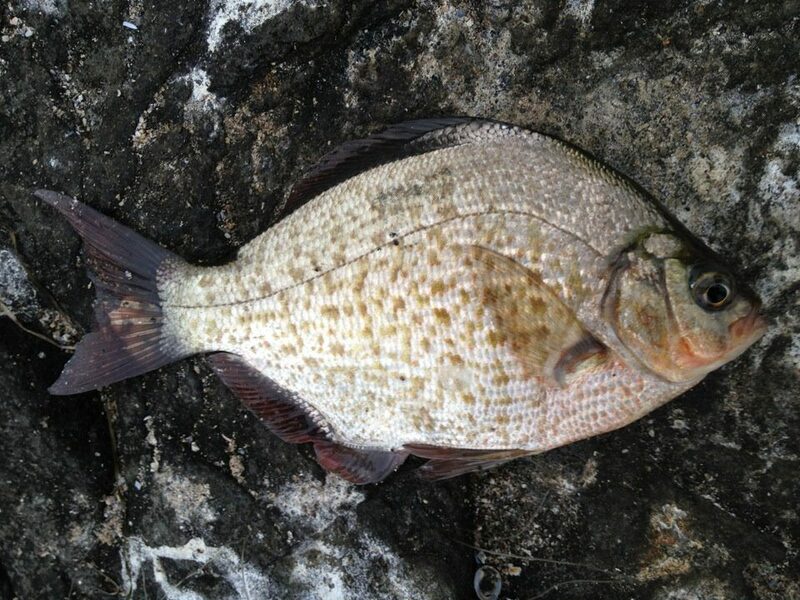 We managed a few small Redtail Surfperch, but the fish weren’t interested in our shrimp. The beach was littered with mussels, and on a whim, we decided to use them as bait. 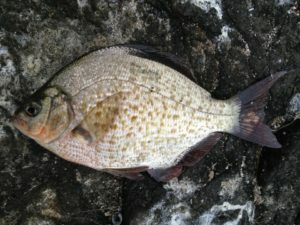 Almost immediately, I caught a right-eyed flatfish. 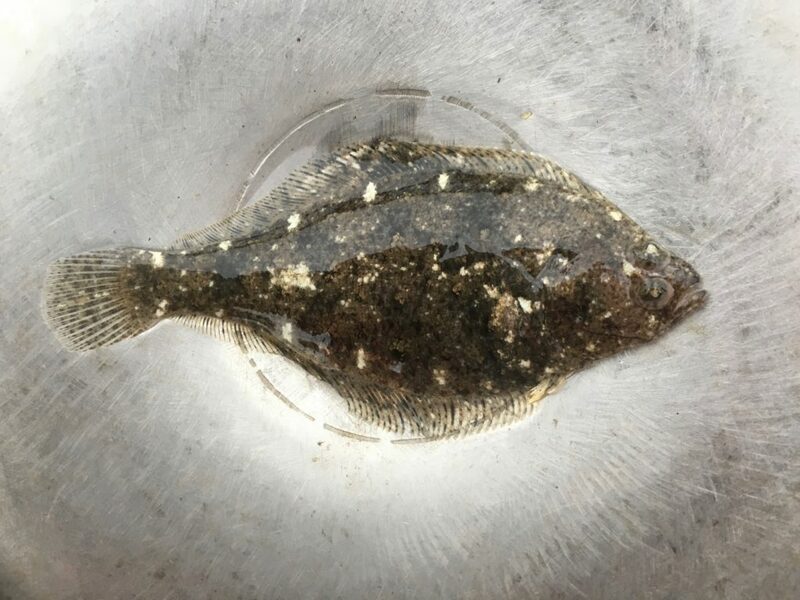 It took years for me to identify it as a Speckled Sanddab because these fish are usually left-eyed flatfish (meaning their eyes are on the left side of their bodies), but occasionally, they can be right-eyed. It was barely five inches in length, but I’m always happy to add a new species. 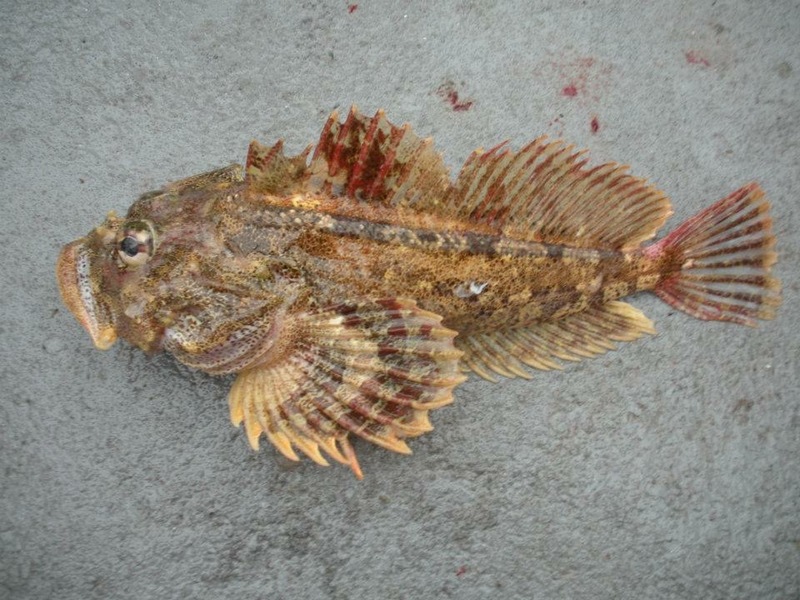 Read the next entry in #SpeciesQuest here: Species #26 — Yellowtail Rockfish. 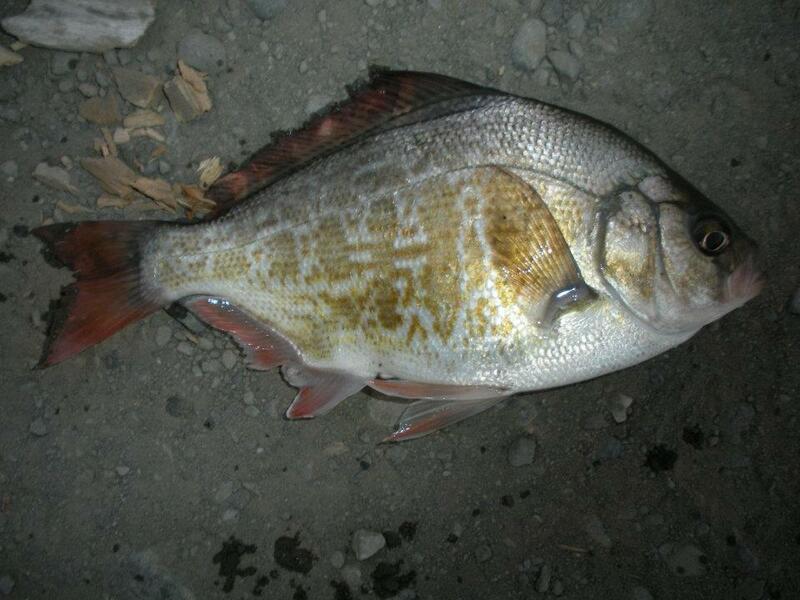 Redtail Surfperch are common on the south coast, but so are Calico Surperch. 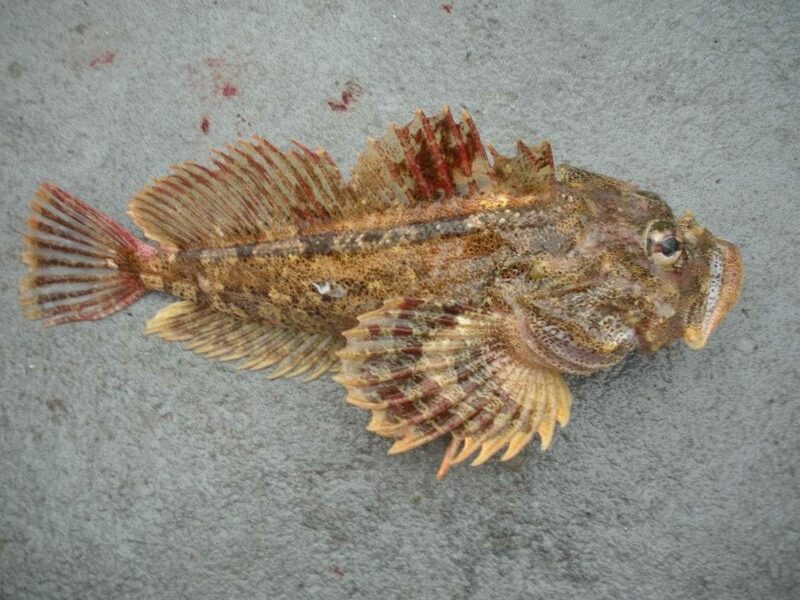 Redtails can be distinguished by two distinguishing features: (1) the markings on the sides of Redtails appear more like stripes or columns, and (2) the longest dorsal ray is noticeably longer than the rest of the rays. “With careful planning, and about $220 apiece, Ben (Blanchard) and I got to go on an incredible trip. The drive was full of conversation and excitement. The worst part of the drive was the last 20 miles to Brookings, where construction was underway. When we got to Harbor, we ate lunch and planned the rest of the day. The seagulls here were even more voracious, eating every scrap that we did not want. Once I was done with my pear, I threw the core on the ground, thinking that the birds would pick it apart. One greedy seagull proceeded to eat the whole thing in one bite. Imagine how horrified it was when it realized the pear core was too big to swallow. For several minutes he entertained us with his gluttonous ways, hopping around, flapping this way and that, and making some sort of pained combination of wheezing and squawking noises before finally getting it down. We spent some time finding the location of the charter boat we expected to take the next day, scouting bait shops, and getting some answers from the owner of Chetco Outdoor Store. He said we reminded him of himself at his age and gave us the tackle we needed free of charge. Arriving at the Winchuck River Mouth at Crissey Field State Park just a few minutes’ walk from the California border, we were ready to fish. 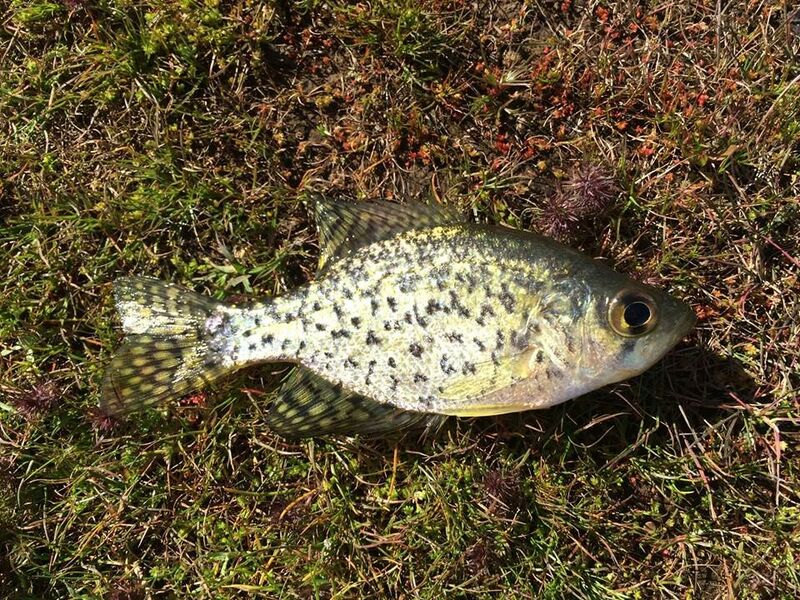 “Crappie rigs” baited with shrimp almost assured our success. Or so we thought. 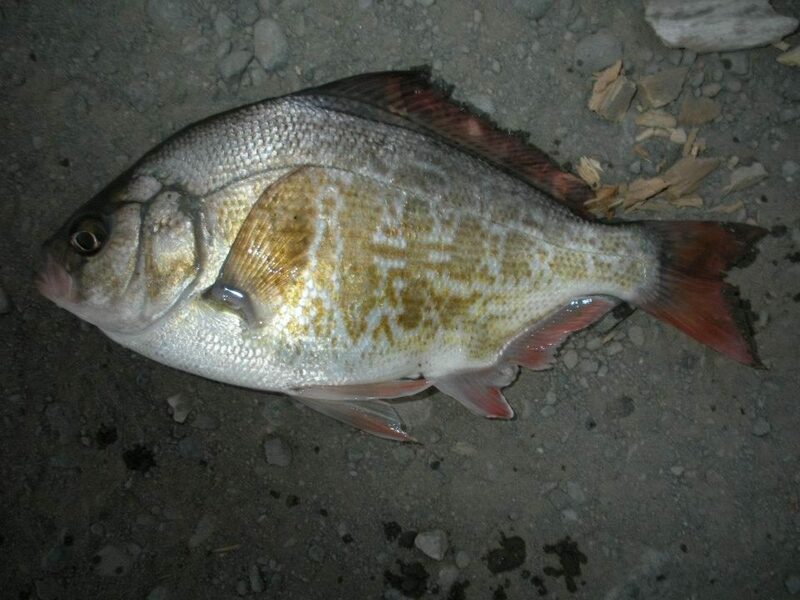 It took a few hours, but eventually I did catch two small Redtail Surfperch (one just under six inches and the other eight) as daylight faded. We crossed over to the north side of the river and prepared for an evening bite. Before we started that process, though, I decided to put on a blue-and-silver Nordic jigging iron. This lure, initially designed for Kokanee, had enticed my first surfperch (a Walleye Surfperch) on the pier in Southern California at the start of that summer, and I thought the combined shininess and castability might earn me a striper or other aggressive game fish. At this time in my life, I had limited fishing experience and even more limited gear. Using the same light tackle trout rods in the surf wasn’t ideal, but it was my only option. As such, each cast required a lot of force. One of my casts sailed out through a small group of circling, feeding seagulls. 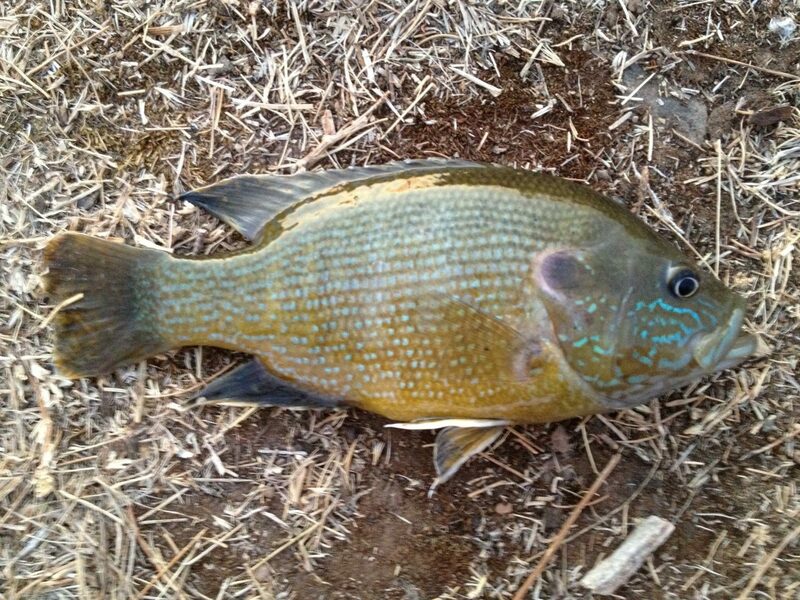 When the lure hit the water, I felt a tension and resistance almost immediately. 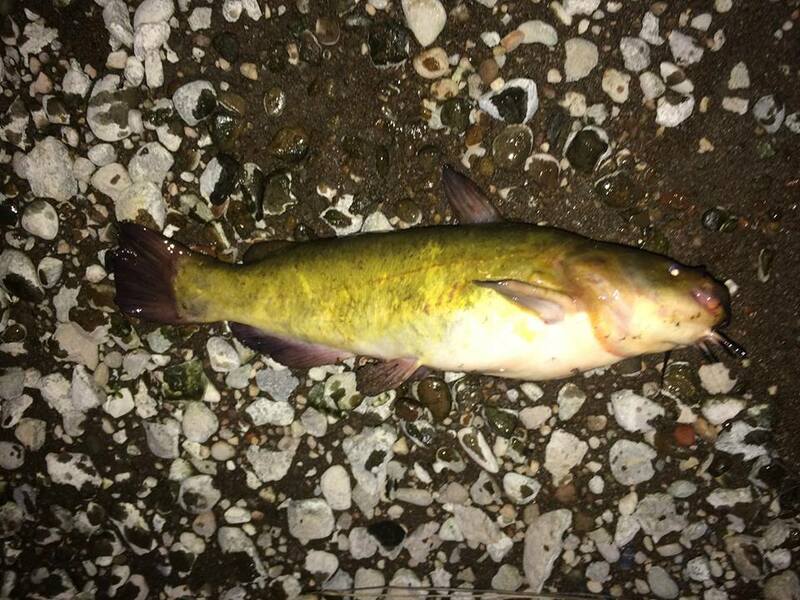 Thinking I had a big fish, I worked the rod in a pump-reel motion. Before long, I noticed that a gull resting on the water was swimming toward me. Frantically, I began to worry that it was chasing my hooked fish. 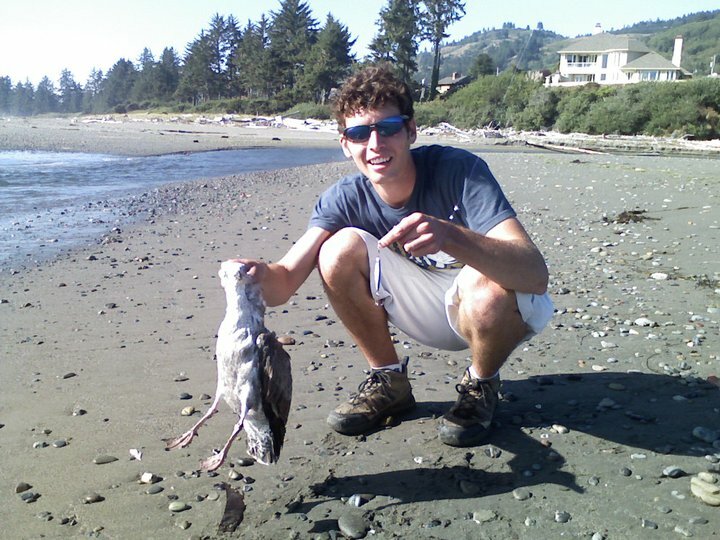 Then came the horrible realization: I had caught a seagull. The hook wasn’t actually connected with bird — thankfully — but the bird was wrapped with the line. Working together, Ben and I unwrapped the line from around the poor bird and set it free. 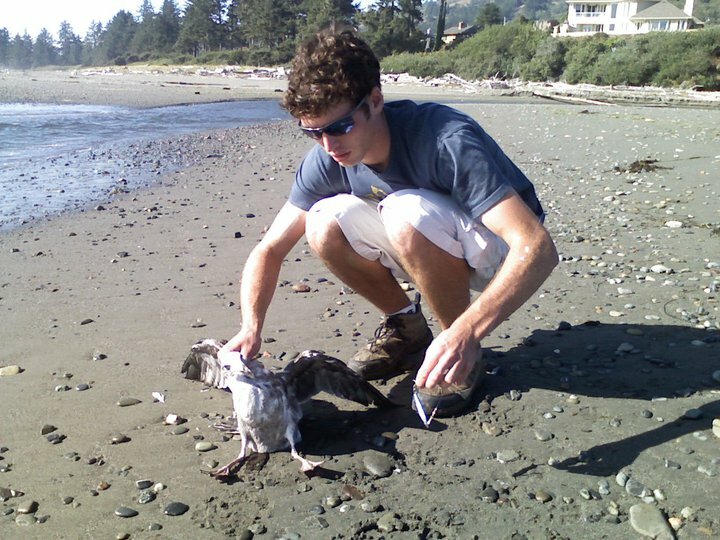 This poor seagull had the misfortune of flying under my cast and being wrapped in line. As I tried to free the creature from entanglement, Ben stopped to take a picture. I was a late bloomer. So what? 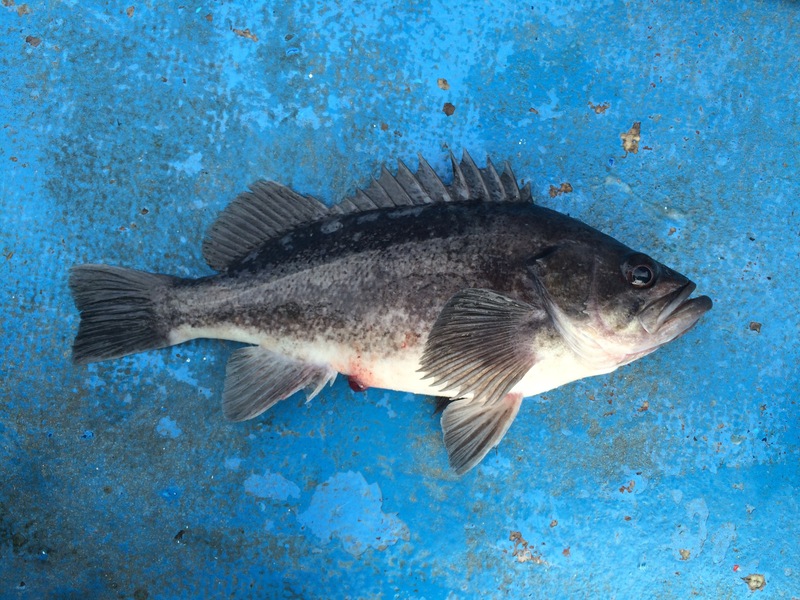 Darkness fell, and we fished off the rocky part of the beach and managed to catch half a dozen small Lingcod (something I haven’t caught in the surf since). Wet, cold, and hungry, we headed back to camp. After the very full day, we got back to the car. A large van drove up and put its lights on us. We were terrified. Our first real trip out on our own after high school, and we were about to be kidnapped before we’d even survived alone for one night. A man rolled down the window, and we braced for the tranquilizer darts. They never came. A rather cross man informed us that the park closed at 9:00 p.m. every night. We played the ‘Dumb Kids Card’ and avoided a fine, while just missing being locked in for the night. We hurriedly returned to Harris Beach State Park, where we were camping, and enjoyed a nice campfire meal of hot dogs and beans finished with a blackberry-peach cobbler cooked right in the coals. We relaxed, quietly reminiscing about all of the near-misses two wide-eyed teenage boys had managed in a single day. Read the next entry in #SpeciesQuest here: Species #25 — Speckled Sanddab. Smallies are as hard-fighting as they are beautiful. Cross County Camp was great. I mean, apart from running 80 or 90 miles in a week, it was awesome. We always stopped and ran along the highway before we even arrived at our destination: Lost Creek Lake. In those days, I was a veritable gazelle, and though I still didn’t like running, I was young, fit, and I managed. Our first day was hot, busy, and full of running. Much of that running took us along the paths that skirted the lake shore. The entire time, I just kept thinking of the myriad fish swimming beneath the alluring surface. When Day 2 rolled around and we had some free time to rest and not run, I grabbed my fishing pole and, you guessed it, ran. I ran harder and faster than I had in two days, heading straight to a small inlet where we’d seen bass sunning themselves the day before. I threw a curlytail crappie jig out and worked it every way I could in the summer heat. When I finally convinced one of the fish to hit, it didn’t matter that it was only four inches long; it was a new species! 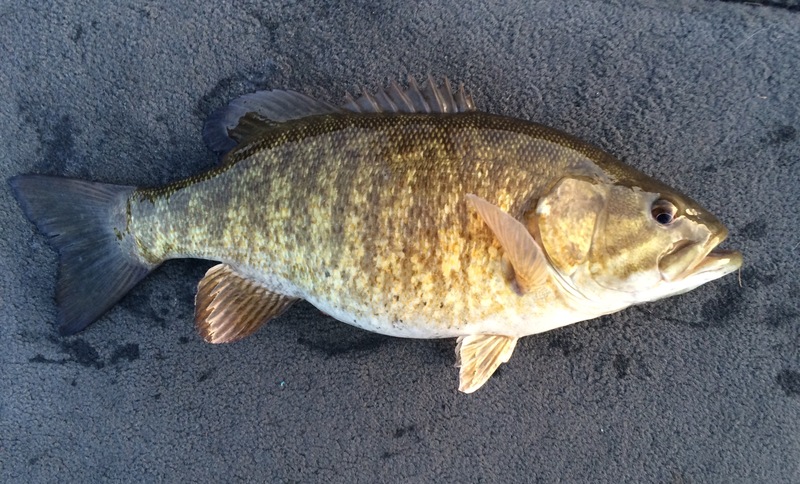 It was my first Smallmouth Bass, and I was ecstatic. Even though I didn’t catch another fish during my narrow window of free time, I ran back to camp happy. And sweaty. But mostly happy. 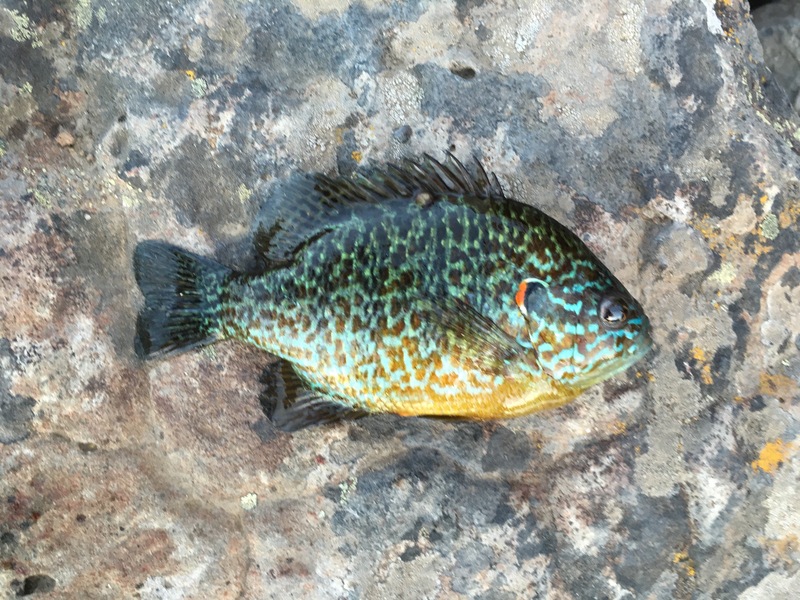 Read the next entry in #SpeciesQuest here: Species #14 — Green Sunfish.